Experience a powerful driving experience that all will love. An SUV that is revolutionized to be the ultimate vehicle with all-new comfort, style and dynamics. Paying attention to details accentuates the characteristics of the Q design as the strength and power is defined by the carefully sculped lines and arches. Luxury comfort and exceptional interior space made from high-end materials further enhances the sense of turning the Q5 into your own private oasis. Until April 30th, Spring into a 2019 Audi Q5 and lease from $290 bi-weekly with a $2,000 Spring Into Audi Sales Event credit! Test drive the 2019 Audi Q5 today! 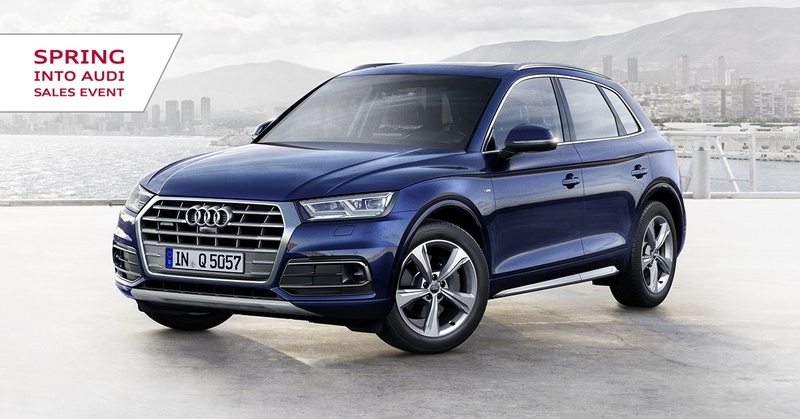 *Limited time lease and finance offer available through Audi Finance on approved credit, on new, unregistered, untitled, and previously un-reported in-stock 2019 Audi Q5 models. Offer ends April 30th 2019 and is subject to change or cancellation without notice. Dealer order/trade may be necessary. Lease example: 2019 Audi Q5 2.0T Komfort quattro (stock #91658) with base MSRP of $48,945 (including $980 freight and $1,115 PDI), at 3.98 % APR for 48-month term with $290 tax-in bi-weekly payment. Lease example based on vehicle price of $47,662 after $2,000 Spring Into Audi Sales Event credit applied (including $500 dealer participation). $1,769 down payment or equivalent trade-in, a security deposit of $590 and first payment of $290 are due at lease inception. PPSA, license, insurance, registration, options, duties, any dealer or other charges and other applicable taxes are extra. See dealer for details. Total lease obligation: $32,241 (excluding applicable taxes). Kilometer allowance of 20,000/year; charge of $0.30/km for excess kilometers. Additional fees and levies apply as follows: $100 air conditioning tax, $17 tire levy, $10 OMVIC fee $51 PPSA fee, $88-wheel lock fee, and $499 dealer admin fee, due on delivery. Send me exclusive offers and promotions. View DisclaimerBy submitting your email address or phone number, you allow us, Audi Ottawa, to include you on our contact lists to send you information about our products, services and promotions. You may revoke consent at any time by clicking on the "Unsubscribe" link in your email.